A representative genomic 16S rDNA sequence of T. parva HT was compared using NCBI BLAST [11,12] under default settings (e.g., considering only the high-scoring segment pairs (HSPs) from the best 250 hits) with the most recent release of the Greengenes database  and the relative frequencies of taxa and keywords (reduced to their stem ) were determined, weighted by BLAST scores. The most frequently occurring genera were Geobacter (48.7%), Leptospira (19.2%), Pelobacter (13.4%), Spirochaeta (8.1%) and Turneriella (6.4%) (56 hits in total). Regarding the single hit to sequences from members of the species, the average identity within HSPs was 95.8%, whereas the average coverage by HSPs was 89.8%. Among all other species, the one yielding the highest score was Leptonema illini (AY714984), which corresponded to an identity of 85.7% and an HSP coverage of 62.6%. (Note that the Greengenes database uses the INSDC (= EMBL/NCBI/DDBJ) annotation, which is not an authoritative source for nomenclature or classification.) The highest-scoring environmental sequence was DQ017943 (Greengenes short name ‘Cntrl Erpn Rnnng Wtrs Exmnd TGGE and uplnd strm cln S-BQ2 83’), which showed an identity of 95.6% and an HSP coverage of 97.8%. The most frequently occurring keywords within the labels of all environmental samples which yielded hits were ‘microbi’ (5.5%), ‘sediment’ (2.6%), ‘soil’ (2.5%), ‘industri’ (2.1%) and ‘anaerob’ (1.9%) (194 hits in total). Environmental samples which yielded hits of a higher score than the highest scoring species were not found. Phylogenetic tree highlighting the position of T. parva relative to the type strains of the other species within the phylum ‘Spirochaetes’. The tree was inferred from 1,318 aligned characters [15,16] of the 16S rRNA gene sequence under the maximum likelihood (ML) criterion . Rooting was done initially using the midpoint method  and then checked for its agreement with the current classification (Table 1). The branches are scaled in terms of the expected number of substitutions per site. Numbers adjacent to the branches are support values from 500 ML bootstrap replicates  (left) and from 1,000 maximum-parsimony bootstrap replicates  (right) if larger than 60%. Lineages with type strain genome sequencing projects registered in GOLD  are labeled with one asterisk, those also listed as ‘Complete and Published’ with two asterisks [22–28]; for Sphaerochaeta pleomorpha see CP003155. 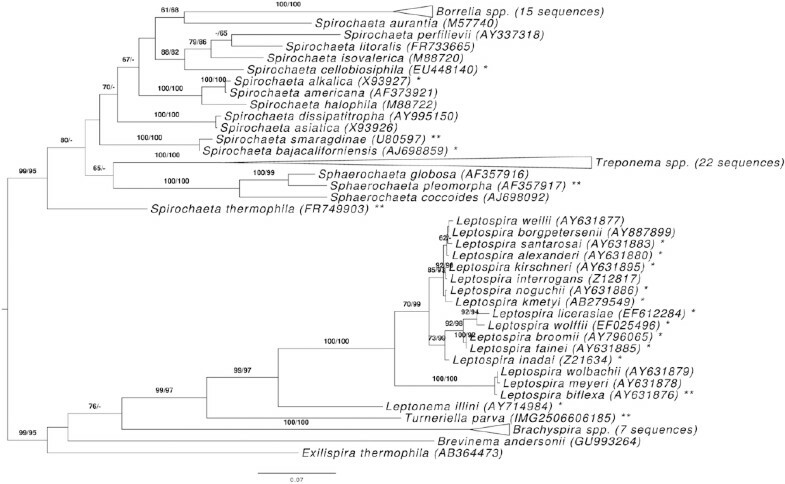 The collapsed Treponema subtree contains three species formerly assigned to Spirochaeta that have recently been included in the genus Treponema, even though those names are not yet validly published . Cells of strain HT are Gram-negative, flexible and helical with 0.3 µm in diameter and 3.5–7.5 µm in length and a wavelength of 0.3–0.5 µm (Figure 2). 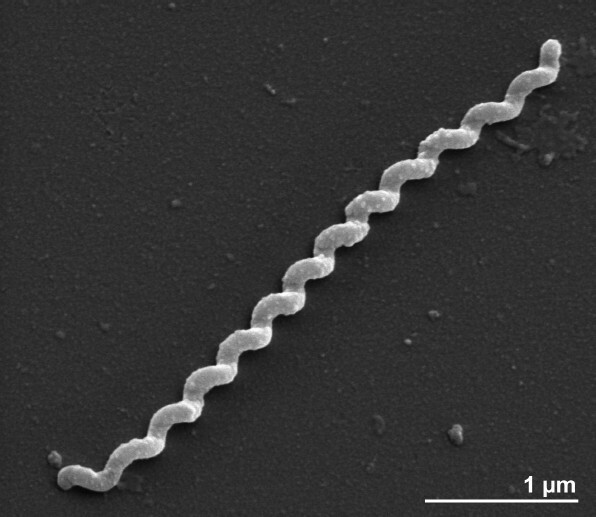 Motility is achieved by means of two axial filaments, similar to those of other leptospiras. The surface of the cells show several blebs with no apparent substructure when prepared for negative staining while under the same conditions, cross-striated tubules are visible in other leptospiras [1,2]. The strain is obligately aerobic and oxidase positive. Slow and limited growth occurs in polysorbate albumin medium  at 11, 30 and 37 °C. Growth is inhibited by 8-azaguanine (200 µg ml-1) and 2,6 diaminopurine (µg ml-1). Lipase is produced, long-chain fatty acids and long-chain fatty alcohols are utilized as carbon and energy sources. L-lysine arylamidase, α-L-glutamate arylamidase, glycine arylamidase, leucyl-glycine arylamidase and α-D-galactosidase activities are lacking . The type strain is not pathogenic for hamsters . T. parva strain HT, DSM 21527, was grown in semisolid DSMZ medium 1113 (Leptospira medium)  at 30°C. DNA was isolated from 1–1.5 g of cell paste using MasterPure Gram-positive DNA purification kit (Epicentre MGP04100) following the standard protocol as recommended by the manufacturer with modification st/DL for cell lysis as described in Wu et al. 2009 . DNA is available through the DNA Bank Network . BAuA. 2010, Classification of bacteria and archaea in risk groups. http://www.baua.de TRBA 466, p. 243.